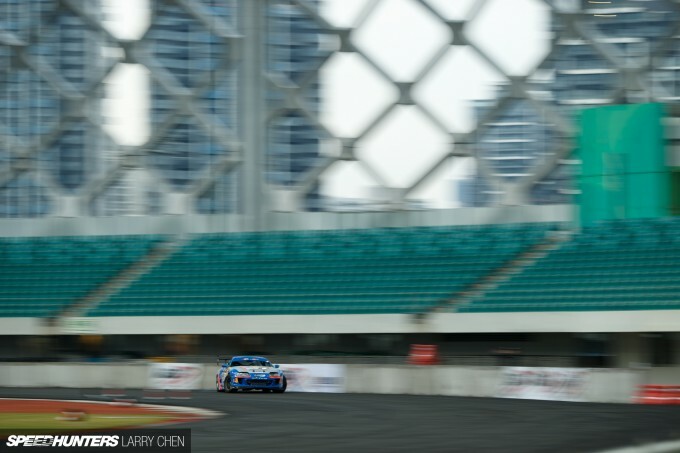 While normally I try to shy away from traditional event coverage here on Speedhunters, it’s nearly impossible for you guys to find out what happens in China. So I figured I would try to go into detail and give you a glimpse of what Team USA goes through trying to compete in a foreign country. 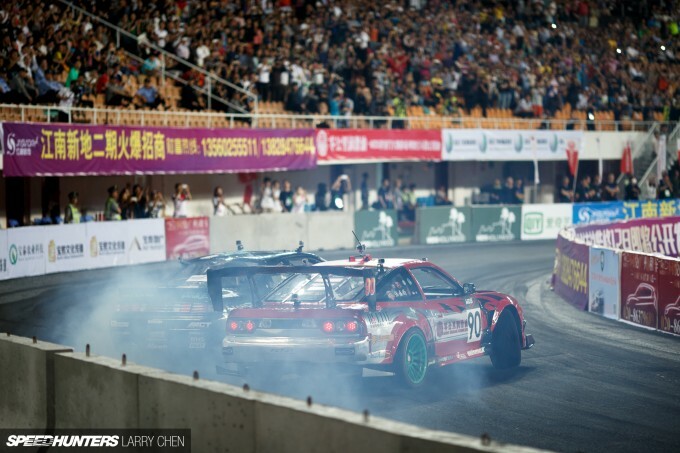 World Drift Series China is unlike any other drifting series. 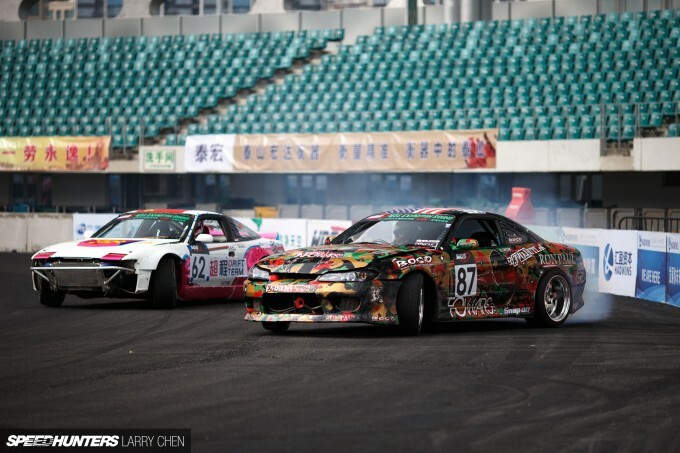 It’s the only drifting series that pays drivers cold hard cash just to show up, and that’s on top of transport, accommodation and everything else for your entire crew. The catch? You have to put on the best show you possibly can, and you have to try to win. How is this possible? Who has that kind of money to fund such a thing? The answer: China. This is a country that’s crazy about drifting. 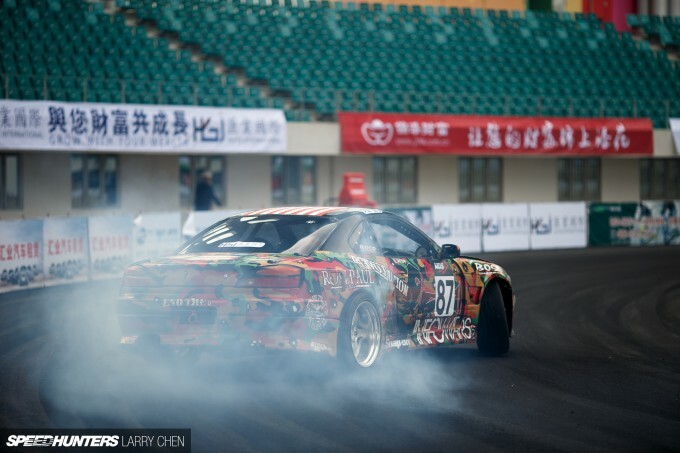 Car culture is on the rise in China, and Mainland Chinese youth are crazy about it – especially drifting. 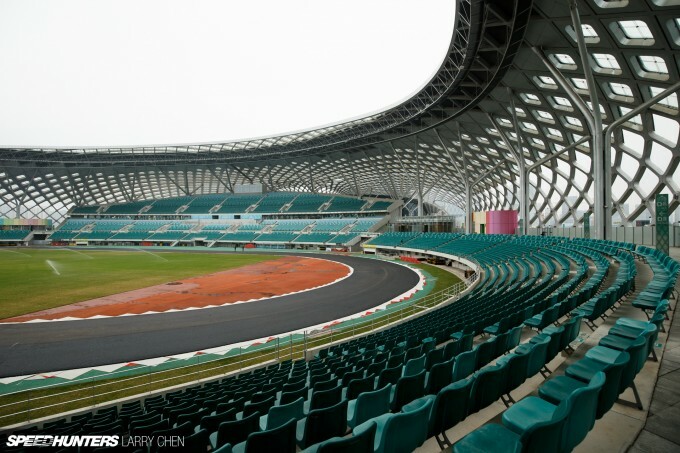 Spectators gather in giant Olympic-sized stadiums to watch drivers from China and abroad battle it out. 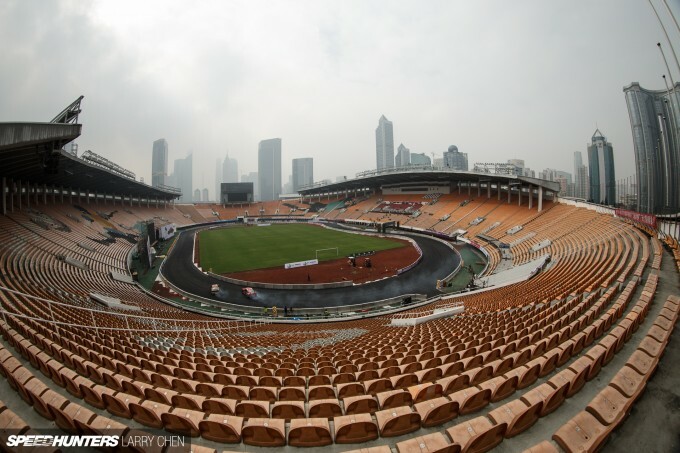 Up to 45,000 fans show up for the big events and millions more watch the action unfold on Chinese TV. 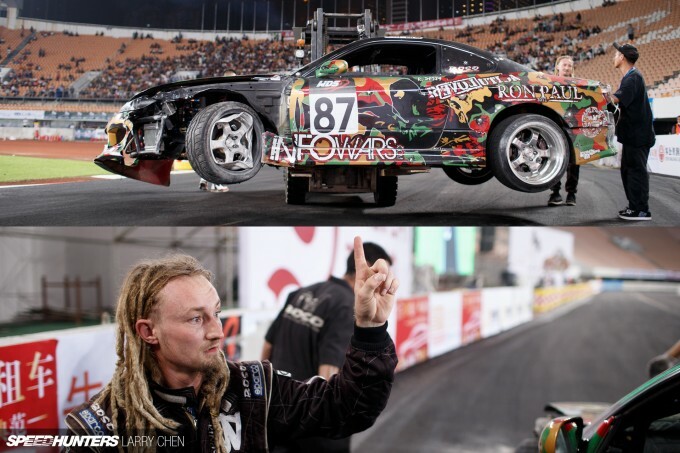 While many people in the drifting community like to knock on drivers for competing in China, you have to remember that some of these guys use their earnings to fund their other drift programs, such as Formula Drift and D1GP. 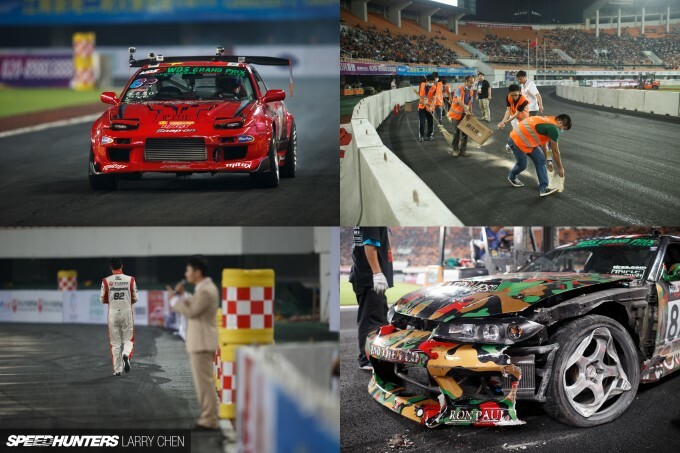 Legends like Mitsuru Haraguchi, Katsuhiro Ueo and Ken Nomura are just a few of the many foreign drivers that have competed in WDS China. 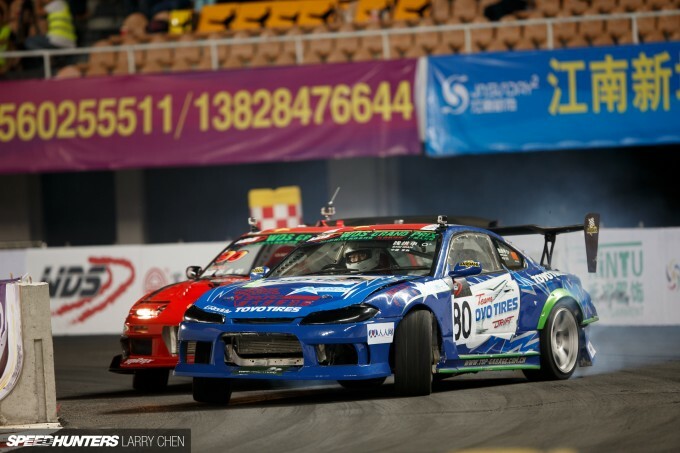 In fact, Daigo Saito battled against Vaughn Gittin Jr. here long before he drove his first Formula Drift event. This year there were only two events, but they ran back-to-back over two consecutive weekends. Four drivers normally make up Team USA, but with a European scheduling conflict for Vaughn, it was left to the experienced trio of Kyle Mohan, Ross Petty and Matt Powers to fly the flag for America. 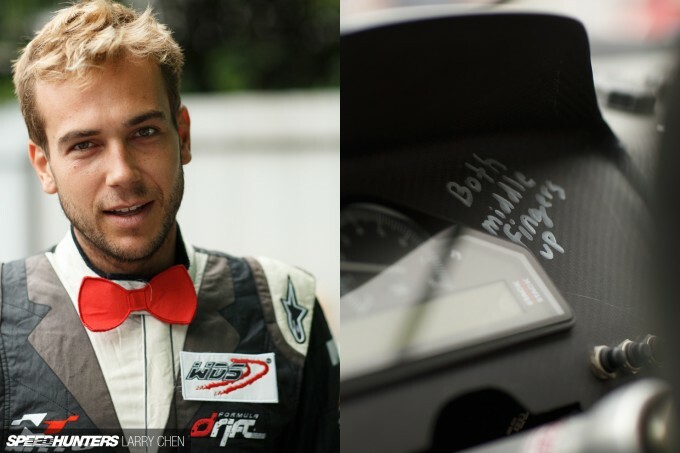 It’s been two years since Ross left Formula Drift, and many people have wondered where he went and what he’s been up to in that time. 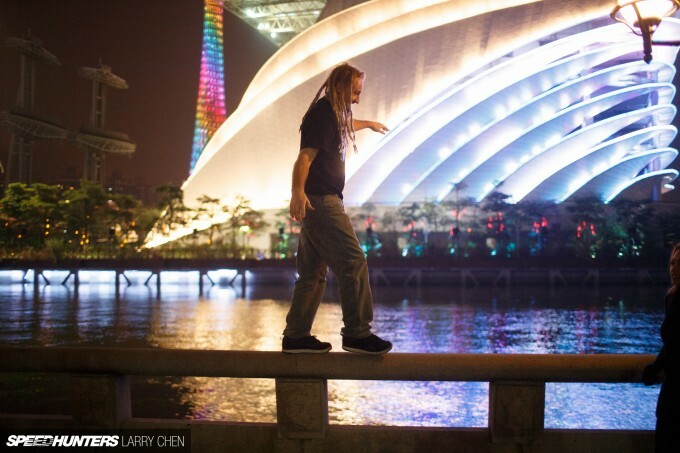 Besides growing some serious dreadlocks, he’s been traveling the world, surfing between Hawaii and Okinawa, and generally enjoying life with his significant other. 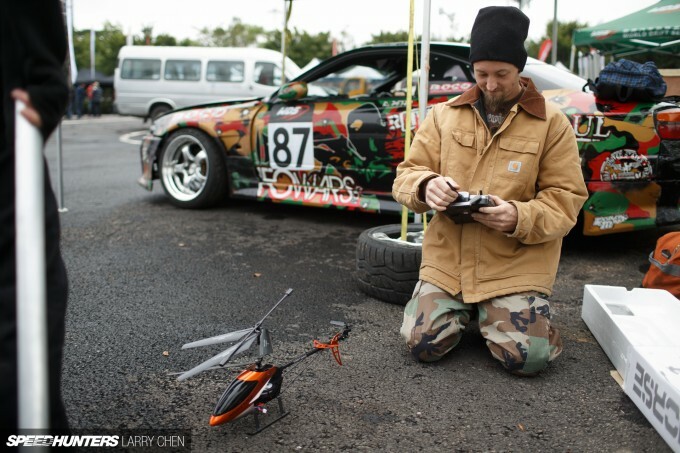 That sounds like the life to me, but of course he couldn’t stay away from drifting for very long. 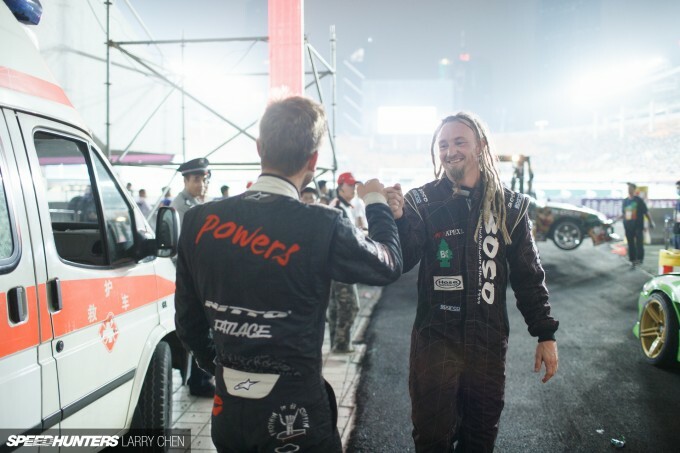 Former Speedhunters driver Matt Powers has been very active outside of Formula Drift, and he’s never been happier. 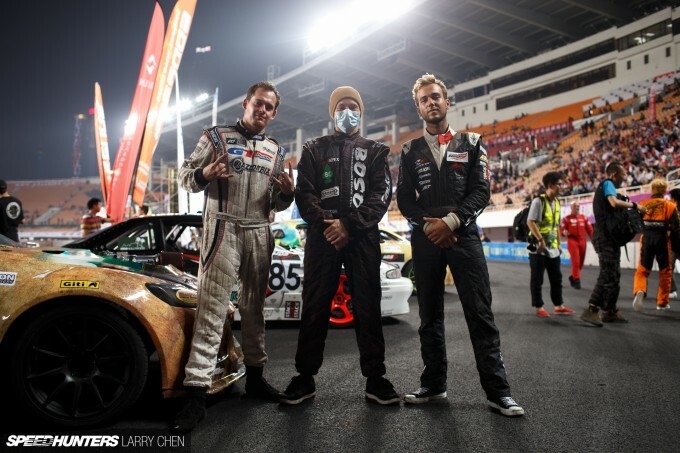 It’s become harder and harder for privateer teams to stay competitive in professional drifting, and according to Matt, in the end it wasn’t fun to be chasing a dream without any reward. When the fun goes it’s time to move on. 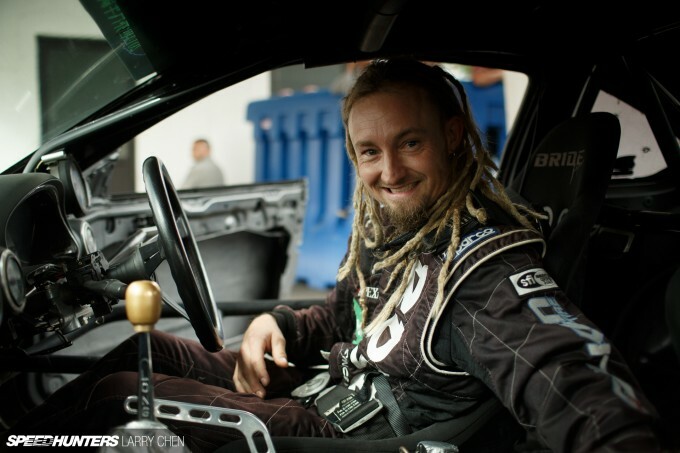 He still drives professionally as a stunt driver, along with competing in demos all over the world. Kyle Mohan has been competing in China since 2008 and he has loved every minute of it. 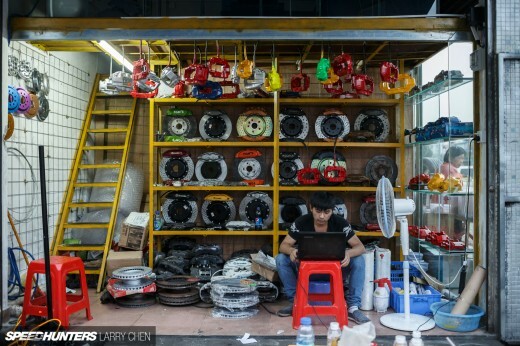 He has even built an RX-8 specifically for Chinese events, but because of the lack of good fuel in this part of the world, it runs an LS V8 rather than a big-boosting rotary. 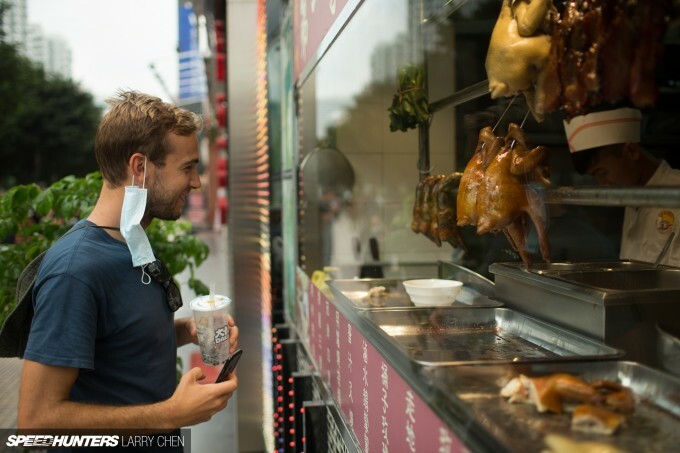 For some of the guys, China always takes a bit of getting used to. Matt is a vegetarian, so meal choices are somewhat limited. Since Ross has been out of the game for a while he took the liberty to get back in shape in between practice sessions. The American team has been coming to China for nine years now, and we have all become good friends. 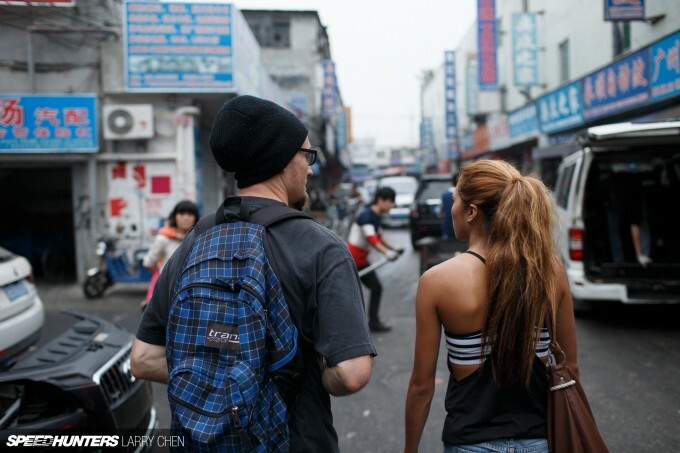 It’s always nice to have people to hang out with away from the track – especially when you’re in a foreign country. 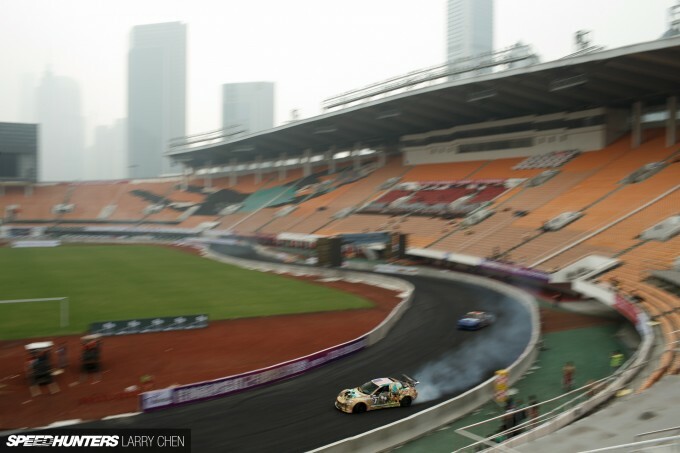 Together, we’ve watched drifting and car culture grow in China. It’s becoming something amazing and the Chinese public love it. We’ve also watched the country grow as well. 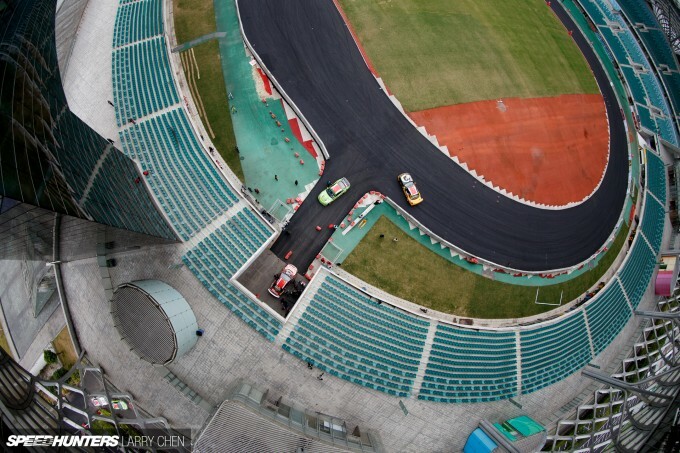 From the time we came here in 2006 to put on the first international drift demo in Beijing, there has been a visual change to the landscape. Back then we were limited in terms of which cities we could tour to. 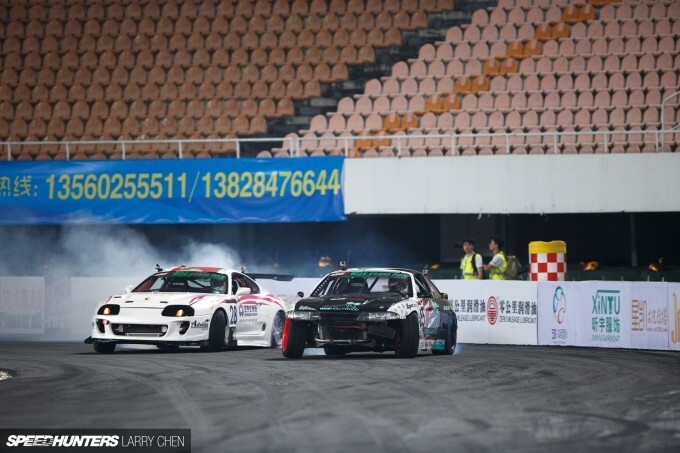 We really wanted to go to Guangzhou and Shenzhen, as both cities are very close to Hong Kong, but no one really knew what drifting was. There were lots of political red tape that the series had to cut through too. 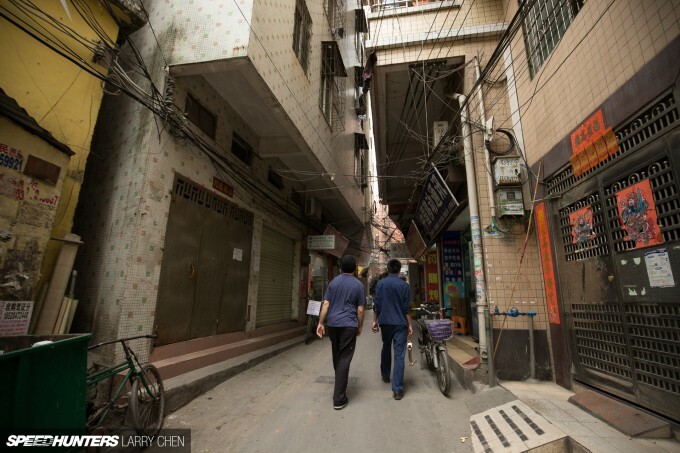 But after years of working with local government in different cities all over China, the opportunity to take the sport to our requested locations eventually came. 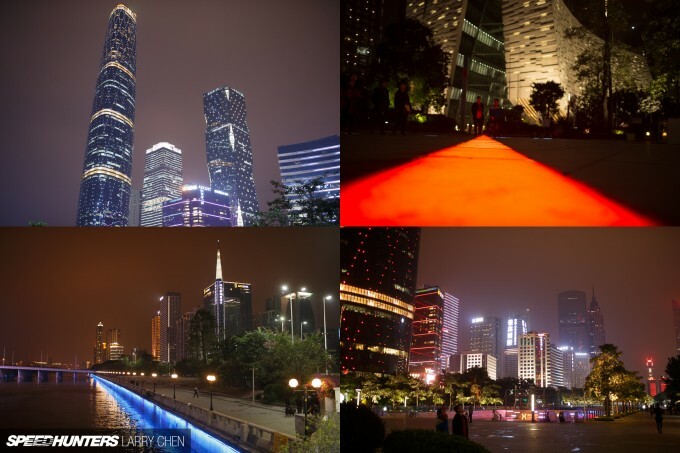 The two neighboring cities are the nicest places I have visited in my 15 years of traveling to China. There is little to no pollution in this part of the country and the buildings are magnificent. 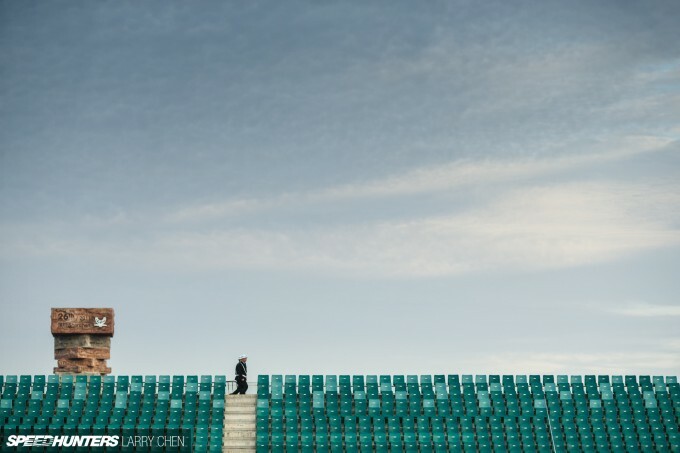 This Olympic-sized stadium where they built the temporary track was like nothing I had ever seen before. 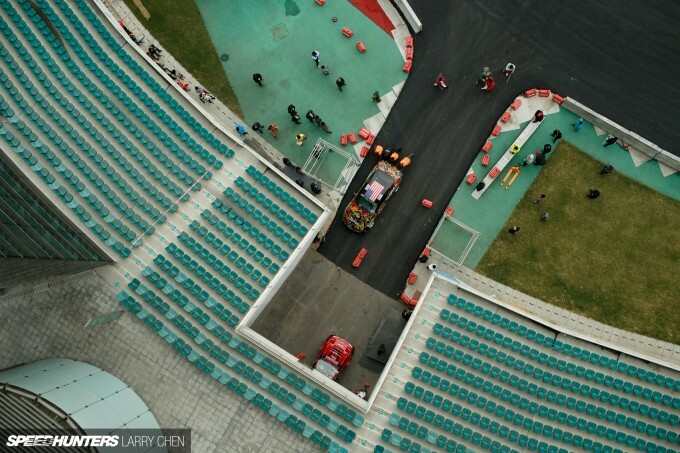 I wish they would pave more than just an oval, but they are taking baby steps towards making a better event I suppose. 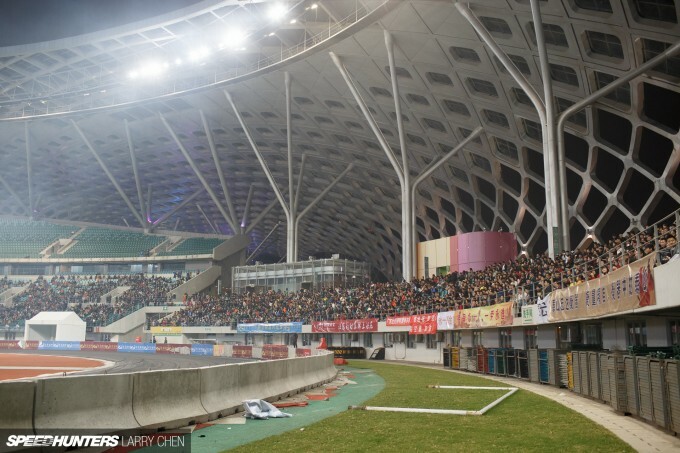 Everytime the series visits a new city, the WDS China organizers and drivers have to put on a good show if they want any chance of being invited back. The first event in Guangzhou started off with a bang for the American team with Matt Powers qualifying in 1st place. 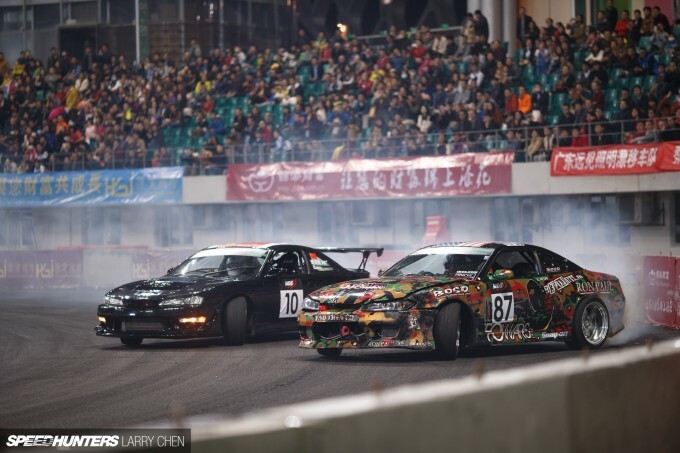 Ross Petty took some time to blow the cobwebs out of his LS-powered S15, but eventually he found his groove and ended up qualifying in 4th spot. Kyle had a few struggles coming to grip with his car’s newfound power – 650hp courtesy of a brand new supercharger setup – but he still managed 5th place. Unfortunately, he ended up losing his Top 32 battle when he got pinched by the slow-traveling lead car. It was a bit of a rookie mistake, but I’m sure Kyle has learnt his lesson from it. 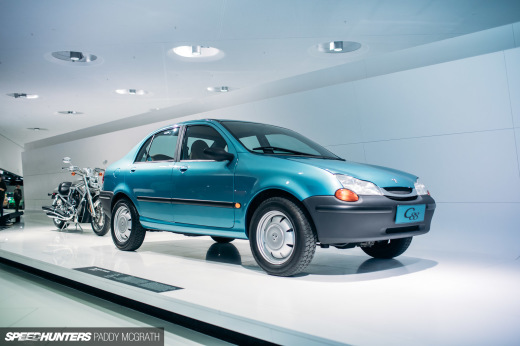 This was the first ever event where Matt Powers had his ‘A’ car in China. 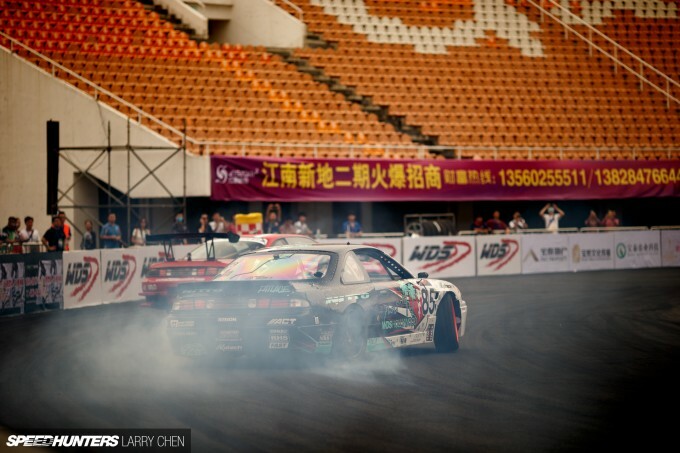 That, of course, is the Silvia S14 he competed with in Formula Drift in 2012 and 2013. Heading into competition, Matt told me that he was going to do his best to win. 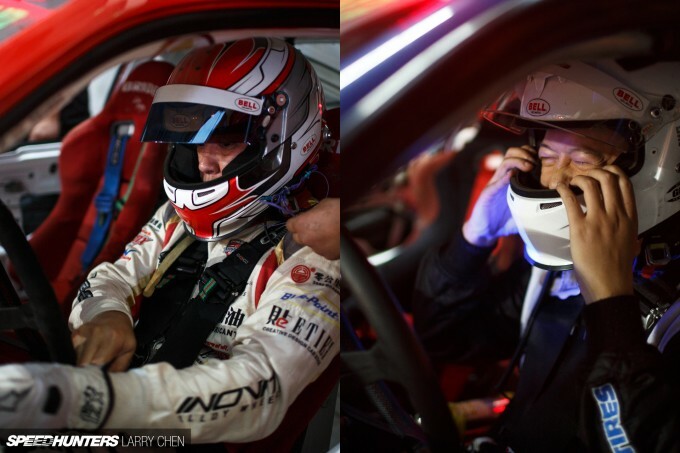 He was going to need every bit of performance his S14 had to offer too, because as the sport itself has evolved, the Chinese drivers have evolved as well. 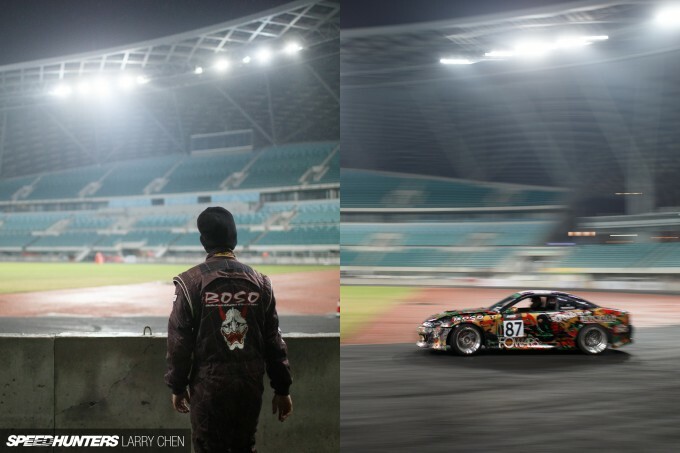 The fans come not just to watch drifting, but to cheer on their hometown heroes in the hope that they will crush their opponents. 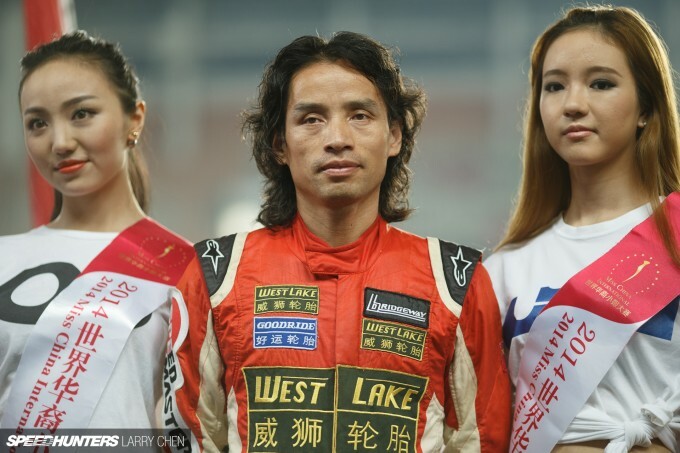 The ring leader, Zhang Shaohua, aka ‘Drifting Gaddafi’, is always one of the top-performing Chinese drivers. His team have pushed the Nissan SR powerplant to its absolute limit. 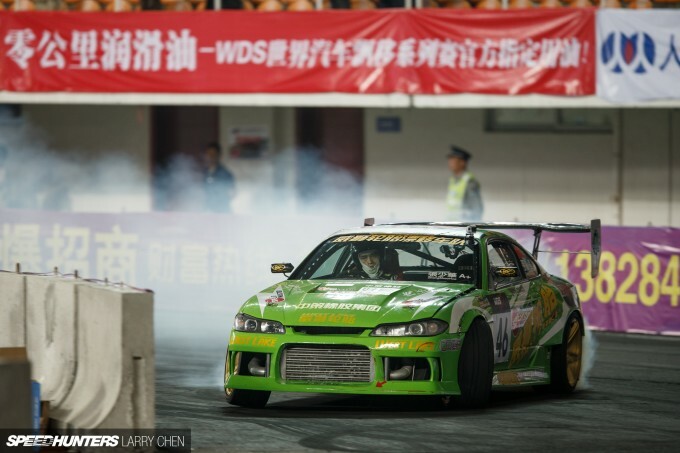 While 500hp was a big deal a few years ago, a Chinese pro car like Mr. Gaddafi’s Silvia S15 easily runs in the 900hp range now with the help of nitrous. He qualified in 7th position, which meant he made it into the Top 16 with ease. 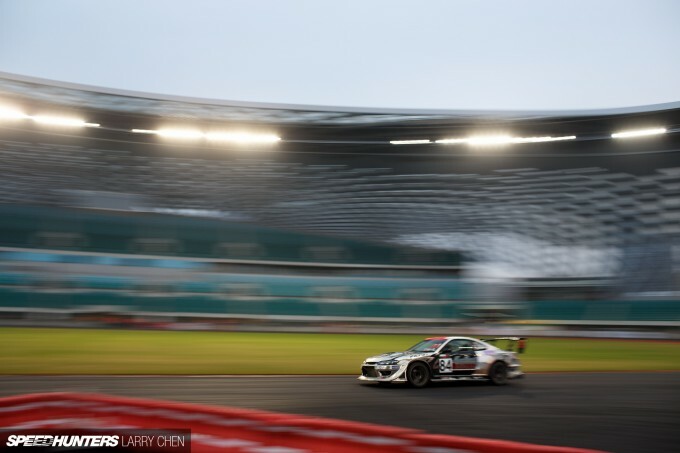 While it’s awesome that the bigger Chinese teams have come a long way with their cars and the skills of their drivers, there is a big gap back to the smaller privateer entries. 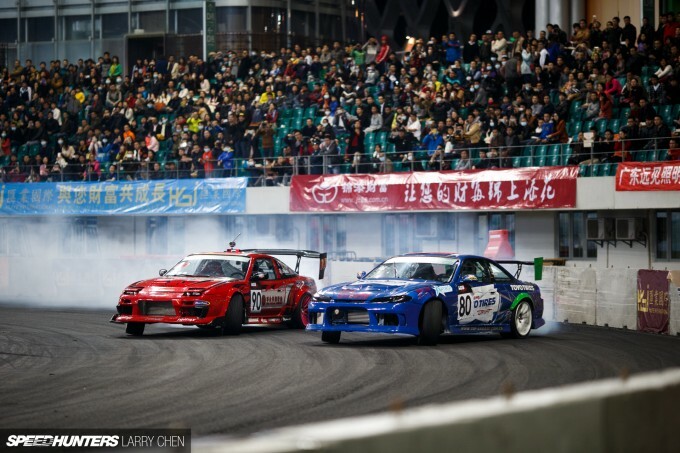 This was an epic battle between two of China’s top drivers – Qian Hongshen followed closely by Zhang Shengjun. Matt easily moved through the ranks while making very conservative runs. He needed to save his car for the big boys. In the Top 4 bracket he met up with Ross Petty. It was a battle of the LS V8 powered S-chassis machines, and only one driver from Team USA could come out on top. I was on the far side of the track when it happened, but all I heard was a loud ‘boom’ followed by the crowd going wild. 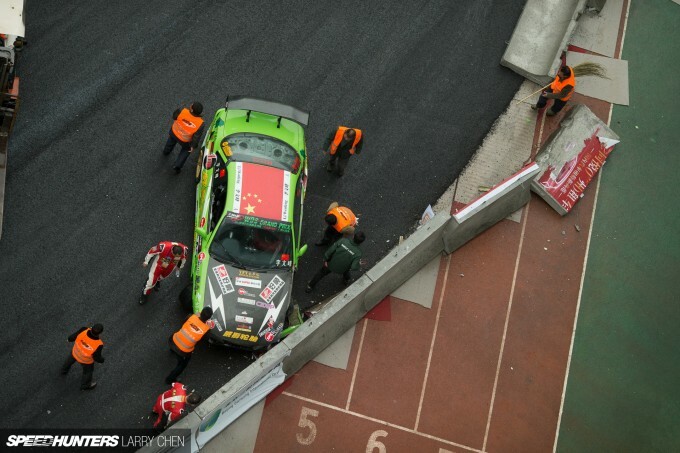 Ross had crashed on the last corner, in the process turning his front left wheel into a Mexican tostada. So what happened? Ross and Matt pushed it hard on the same lines that they had been driving all weekend. The only difference was, the line Ross took on the inside to get close to Matt had been completely oiled down by a local driver. Matt took the win, but it would’ve been great to see the two American drivers battle it out fairly. Given how closely matched their runs were, I’m sure they would have gone one more time. In the finals Matt went up against Zhang Shengjun, and while I am all for cheering on the home team, there was a clear winner. Because there are no rules in WDS that govern tire-to-weight or anything else for that matter, the RPS13 was a lot faster. Matt happily took 2nd place as it was the best he could do with the cards that were dealt to him. 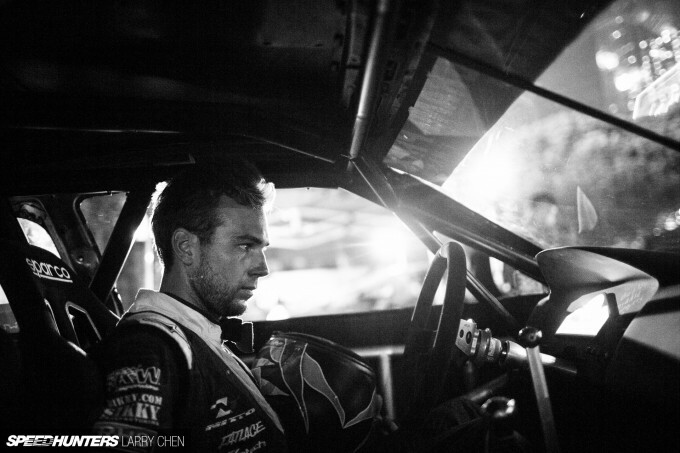 While he wanted to stay for the 2nd round in Shenzhen the following weekend, he had a flight to catch to New Zealand the very next day for Red Bull Drift Shifters. 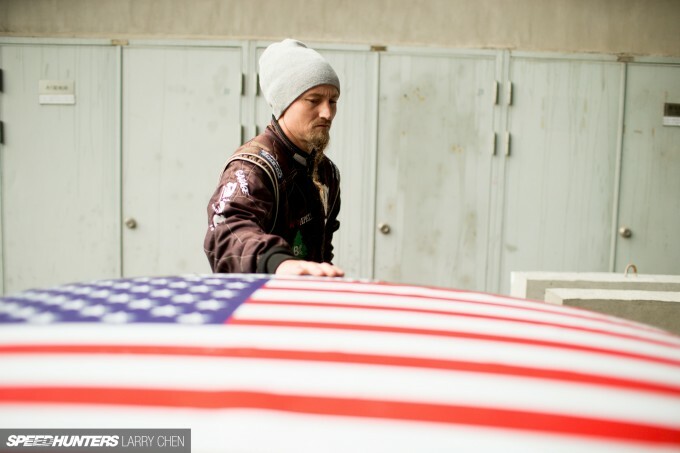 With just a few days to fix the S15 before qualifying in Shenzhen, the next morning Ross and the crew wasted no time to take apart and inspect the beaten and battered S15. 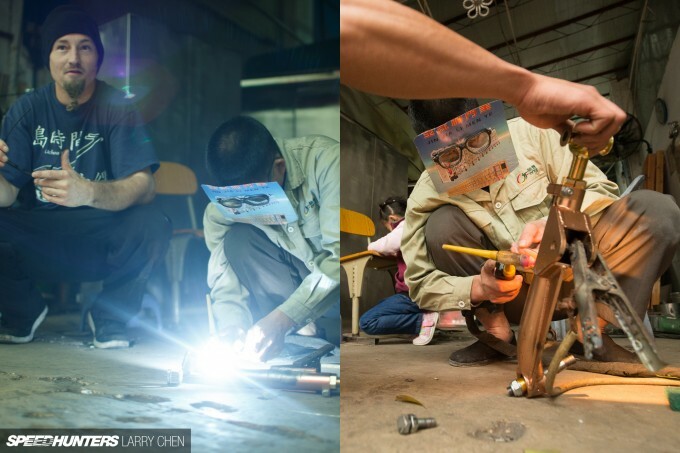 Once they knew what they were looking at, it was nothing a little bit of elbow grease and Chinese ingenuity could not fix. There were lots of loud noises and plenty of hammering going on as soon as the car was up on the lift. Ross brought his crew chief, ‘Gremlin’, over from Southern California to help out – and he definitely did just that. 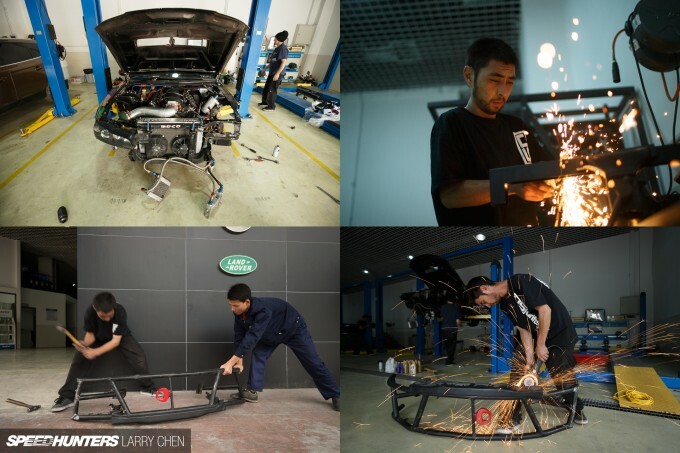 I went into detail about our adventures looking for replacement parts in the middle of China, and if you guys have not already seen it you can check it out here. On top of needing to find a left-hand side S14/S15 knuckle, the crew also had to get some things welded. The shop that Ross’s car was being repaired at knew exactly who to take us to, and after a series of long streets and underground tunnels we arrived at his shop. Here, we were in for quite a surprise. If welding was your profession, you’d spend money on a good welding mask, right? Not this guy. He had simply taken a piece of cardboard and cut two holes in it slightly smaller than his glasses! He took one look at the control arms we needed welding and got straight into it. The pieces of aluminium were TIG welded with ease, and I have to say it was some amazingly tidy work. 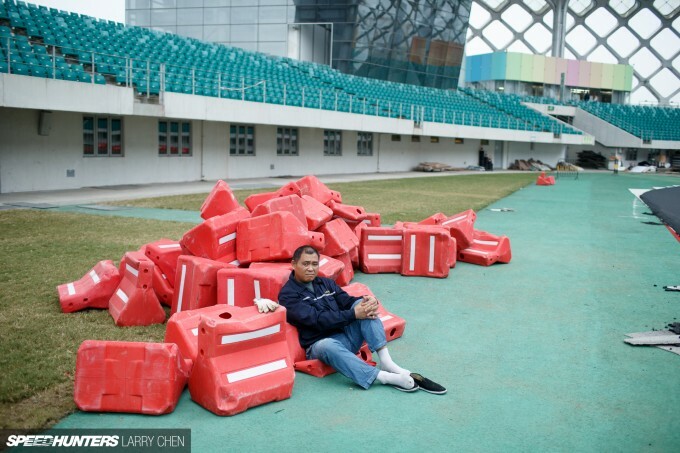 I was curious to find out how much this sort of work paid, and he told me that he earns a wage of 6,000 yuan per month. At the time of this writing, that roughly translates to US$950 per a month. 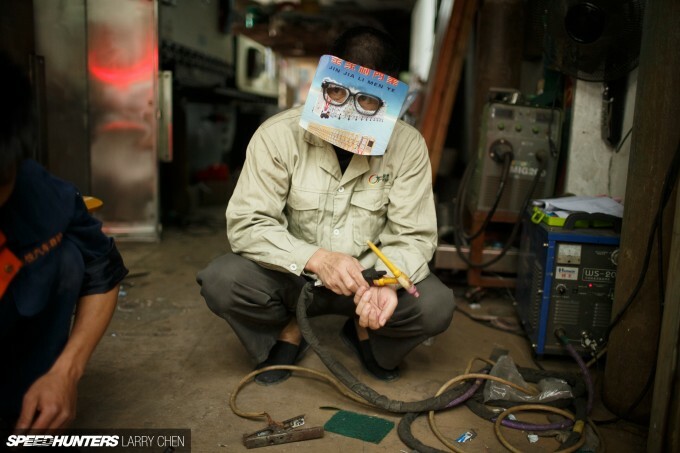 If I ever go back to this city, I’m going to bring him a nice welding mask for helping us out. His charge for the faultless control arm repair? US$2.00. It took three full days to knock the S15 back into shape, and we even had to outsource the fiberglass work. 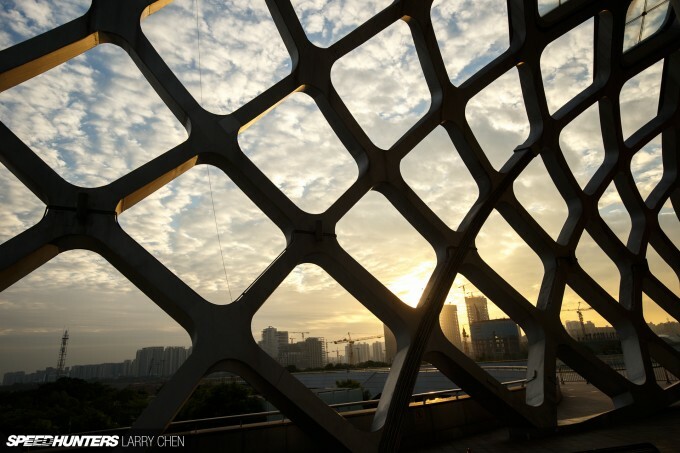 That meant there was enough spare time to do a bit of exploring around the city of Guangzhou. When I say that this is the nicest place I have ever visited in China, I mean it. Apart from the ultra low pollution, the quality of life here is great. And where else in the world can you go to a Will Smith themed restaurant that serves chicken feet and Rocky Mountain oysters?! For the following weekend’s event, we took a bus to the city of Shenzhen and found the S15 already there waiting for us. The body parts had come back from the fiberglass shop and were looking good as new. Ross even had time to purchase some new toys in which to play with between practice sessions. 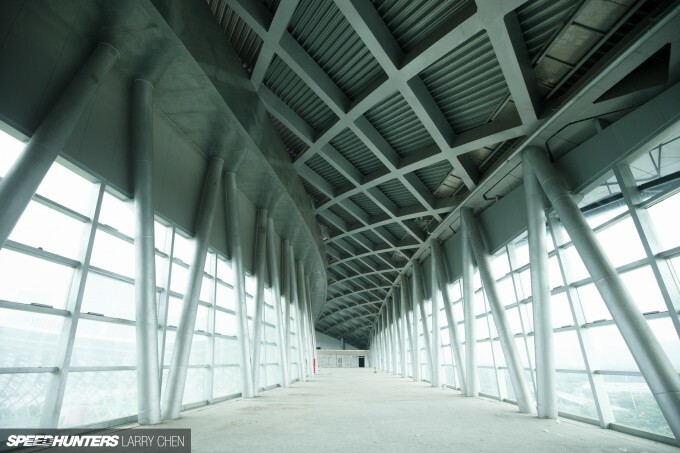 The Shenzhen Bay Sports Center was unlike any other stadium I have been to before. 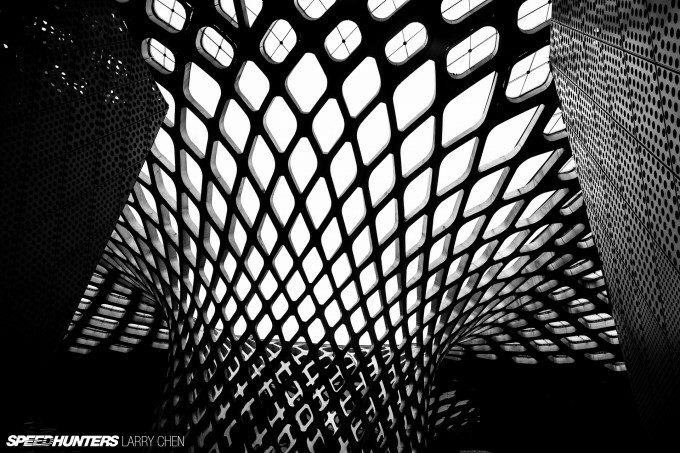 While it did not seat as many people as the Water Droplet, there was no shortage of stunning architecture. This was the judges tower, which although looks all fancy in the the daylight, was cold and miserable at night. It’s almost as if the stadium was never really finished. There was no electricity up top, which meant no lighting or heating, so the judges almost froze to death. 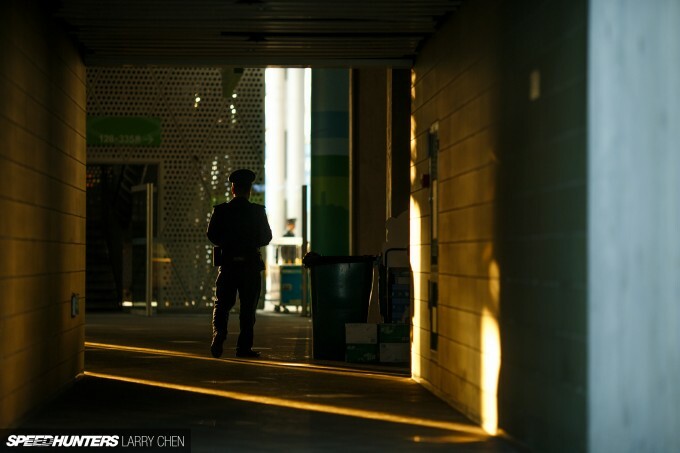 Seeing as the stadium security was run off their feet, I figured it would be a good chance to explore the facility. If you guys have followed my stories before, then you’ll already know that this is my favorite part of shooting on location. 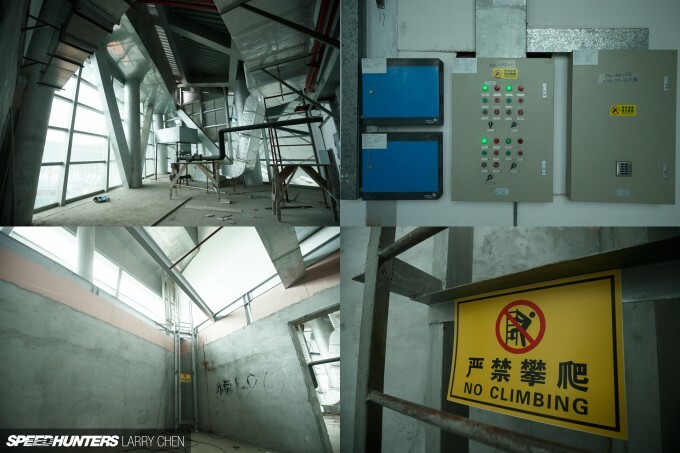 Urban exploring is just like putting together a puzzle, and with enough persistence there are ways to gain access to anywhere. The elevator was out, so I found a closely-guarded secret entrance. Once inside the staircase I found a way to get onto the scaffolding, but it was locked. I felt as if I was in a video game, because upon closer inspection it looked like zombies had already had their way with this place. There were so many rooms to explore – many with buttons that looked fun to push. And of course, I found a ladder that led to the upper scaffolding. 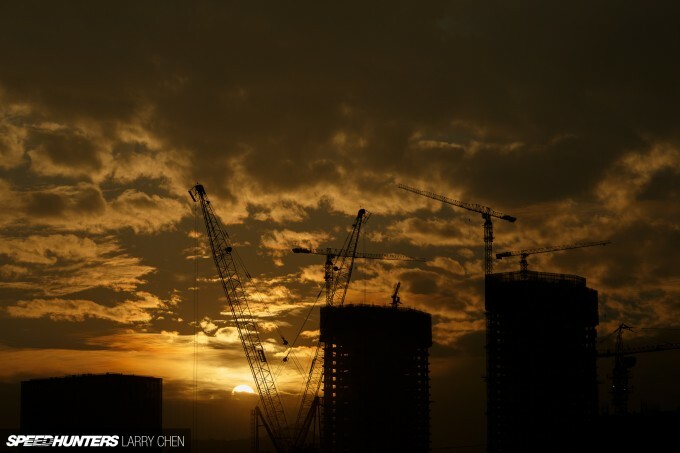 While I have experienced some sketchy scaffolding in China, this was the complete opposite. Most of the times I find welds that look like rusty boogers, but this structure appeared to be very sound and sturdy. 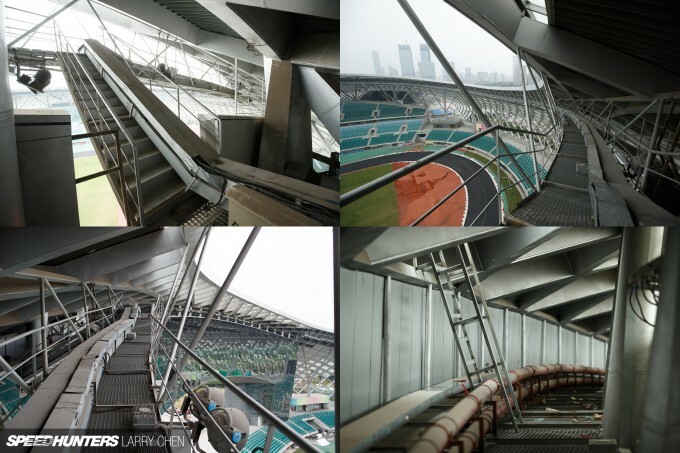 There was even a ladder to the outer shell, which was essentially a slide to your death. The view was great. It’s always nice to get a different perspective on the action. Light rain started to sprinkle a little, and a soggy track always means contact with the outside k-rails. It didn’t take long either. The k-rails were actually not tied together, so it was kind of fun to see how many of them the drivers could knock over. I watched Ross practice earlier in the day, and he was running pretty well considering they had buttoned everything together in a short time. I wanted to get some shots of him from above, but the only view I got was the track workers pushing him back into the pits. I knew something was gravely wrong with the car. Qualifying was starting very soon, so Ross and the crew had a very limited amount of time to fix the car if he was going to make it. When I got to the pits I found the boys scrambling – they had broken a ring gear in the diff, and it needed replacing. Luckily for Ross, one of the Chinese teams had a spare, so his team went to work. There was a problem though – one of the bolts was seized on, and it looked as if they were not going to make it. After 30 minutes of non-stop impact wrench action and four broken sockets, the bolt head sheared off. It couldn’t have been closer, but guys slapped it all back together just in time for Ross to make his two back-to-back qualifying passes. Ross took 1st place in the wet, and you can tell he was pretty happy about it. Just like in Formula Drift, the drivers pay special attention to the judges’ every words in the post-qualifying meetings. The next morning Ross and Kyle easily ran through their Top 32 competitors, but the way the bracket was stacked the two were destined to meet in the Top 8. Only one of the American drivers could make the Top 4. Both Ross and his girlfriend went over strategies as she was also his spotter. At this point at least one of the Team USA drivers still had a shot at the podium. With Matt and Vaughn away at other events, there is only so much a two-man team can do. 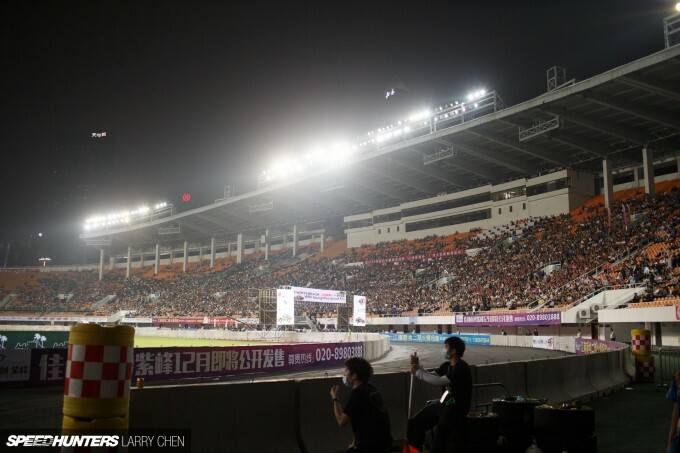 The stadium was surprisingly packed for such a new event. 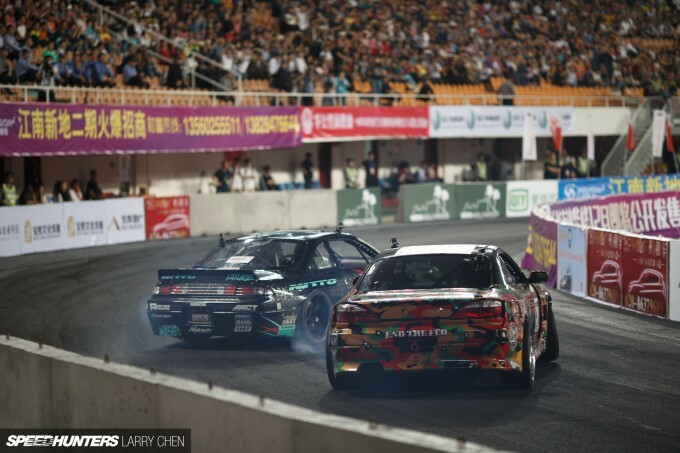 It was the first time anything drift-related had even been held in Shenzhen, and about 20,000 people showed up to witness the action. There was no turning back now. Even if Ross got knocked out early on in the Top 16 it would be a good effort considering how long he had been away from drifting. Of course, it didn’t happen that way. He pushed hard and made it through to the Top 8, as did Kyle Mohan. I was just happy to see the two teammates pushing so hard. Kyle put on a performance of a lifetime, riding the wall the whole way and grabbing the win and a spot in the Top 4. There was no better way he could have redeemed himself from the last event. Kyle pushed hard in the Top 4 bracket but lost, which meant he would have to fight for the final podium spot. In that battle, with one final corner remaining, something terrible happened. The car caught on fire. 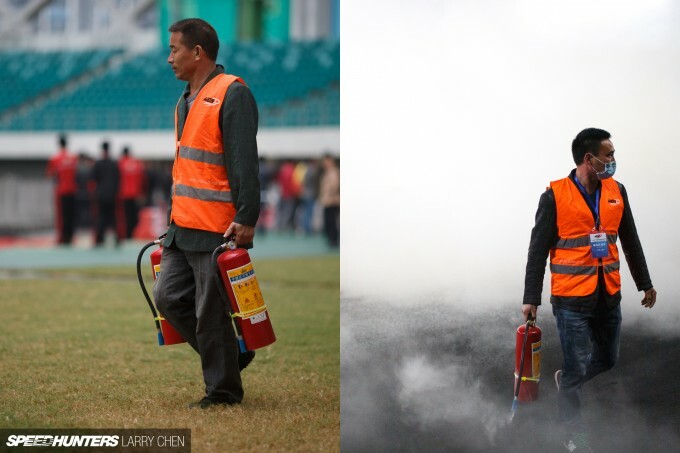 There were dozens of Chinese fire marshals surrounding the track, and after two weeks of just sitting there doing nothing with their extinguishers they were itching blast them at the tiniest flame. When they saw that Kyle’s RX-8 was ablaze they did not hold back. But then one of the guys yelled out what translated to ‘it’s not one of ours’, at which point everyone running towards the car stopped dead in their tracks, turned around, and walked back to the pits. Where was the camaraderie?! While I am not trying to make fun of the way these drivers and teams act, I found it kind of interesting. 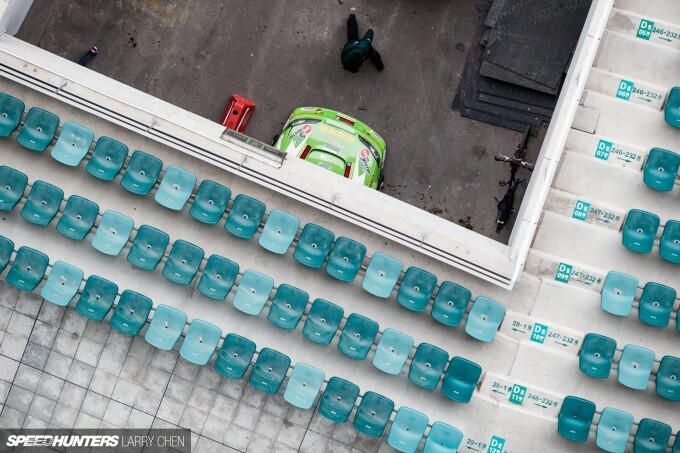 Of course, we can’t fault them, because up until nine years ago none of the Chinese drifters had ever even competed against professional drivers from other countries. 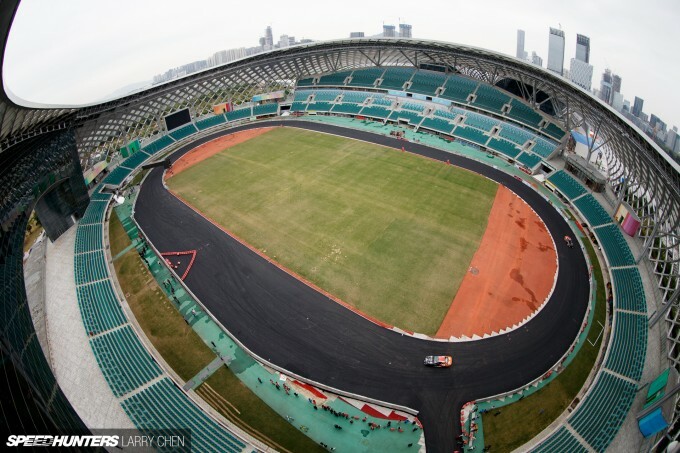 My hope is for some of the top Chinese drivers to come to Formula Drift and check out what it’s like on the other side of the pond. 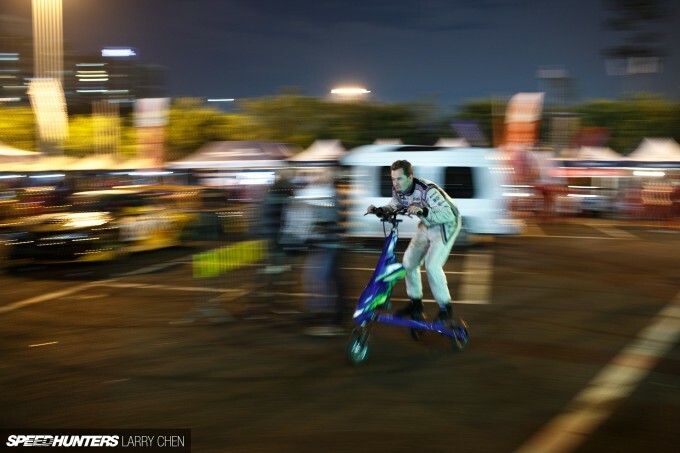 For almost a decade now, competitors from all over the globe have convened in China to battle it out with these hometown heroes. In my eyes, there are many who are now ready to leave the nest and compete in the real world. They are certainly skilled enough and have the financial backing as well. 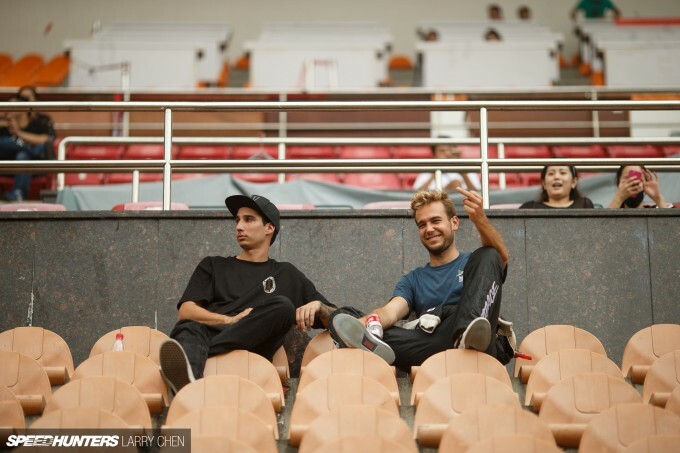 Ross and the rest of Team USA won’t stop competing in China anytime soon – it’s a dream job of sorts after all. But it doesn’t come easy, and the boys work even harder when they are competing in a foreign country with long hours, no sleep and harsh conditions. Sure, it’s easy just to take the money and not qualify every time, but at the end of the day it’s all about putting on the best show possible. If that means pushing hard, then these guys will push to win every single time. I love Kyles se3p and its a shame it caught on fire but its something all of them are prepaired to handle. Besides the rx8 catching on fire, were there any other issues with the way it handled?? I'd love to have a car like his someday but i was curious if there are any issues he ran into with its performance?? Every year I wait for this post to show up on SH, China looks like a blast! 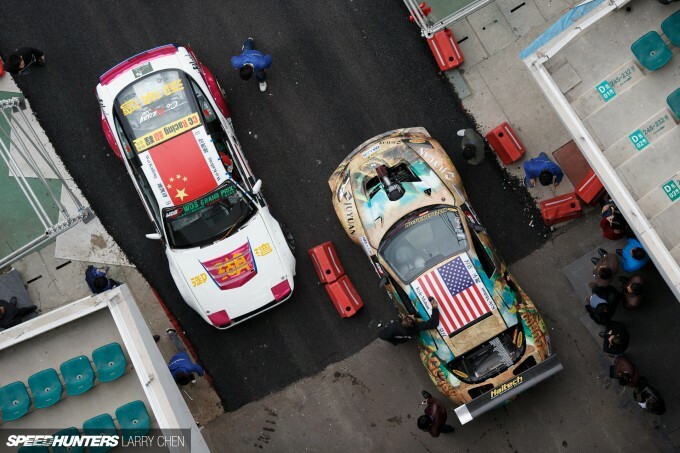 Larry, I always enjoy your China coverage. Although not the result he wanted, that photo of Kyle emerging from the smoke is super cool. Do I see an 8 into one header on a front engined car?!! @chris chabre You ain't kidding! Weld flash is very painful! I got it by accident MIG welding. I can only imagine his pain for the next few days. He looked at the glow on purpose! 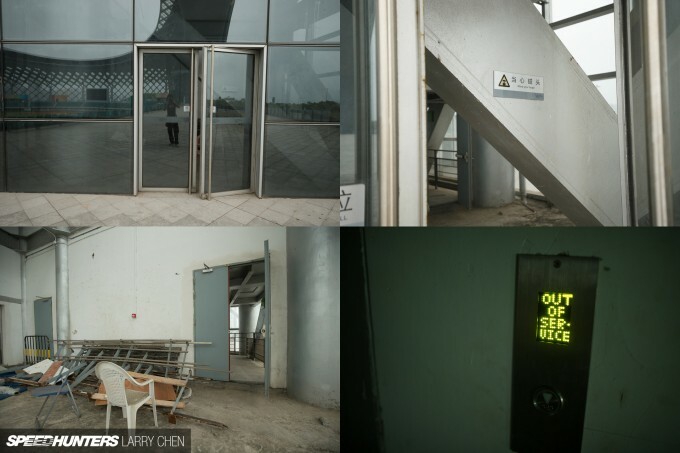 More WDS China videos (like 08-10) please Larry! @Sausage Haha, the events have changed as you can see. 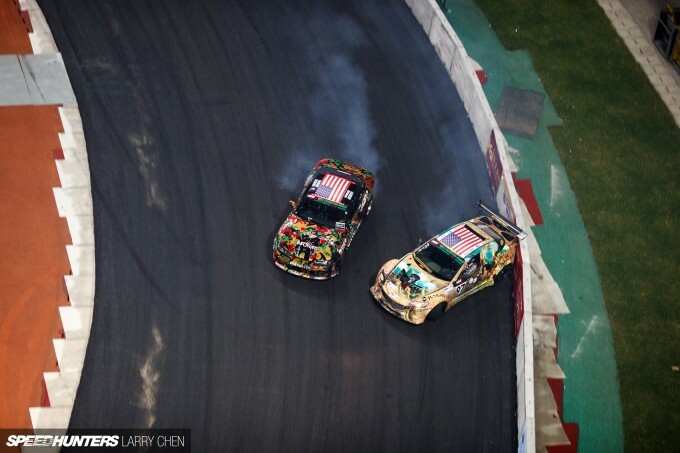 Believe it or not, they have become legitimate drifting competitions, not like the wild wild east, like before. @chris chabre Dude does not even wear socks. JustinOdijk Yeah, it was totally worth not breathing for a minute. Jordan_Burgess Haha, yeah, but when Kyle earns his first podium that champagne will just taste that much sweeter. PhilippBerndt Thanks for the support. I am glad you liked it. LukeHuxham You should definitely come and shoot a video next year. Just bring a gas mask. @tom I will tell him to chime in on here to answer your question. @Joey23jojo Ah, the only problem I see is the space issue. There is just no where to really drift, besides some street closures. Make sure you guys check it out in presentation mode. 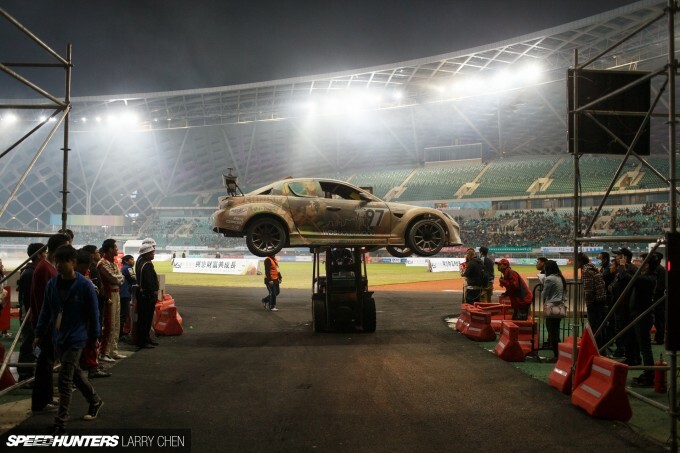 China will copy the whole drifting scene as well? 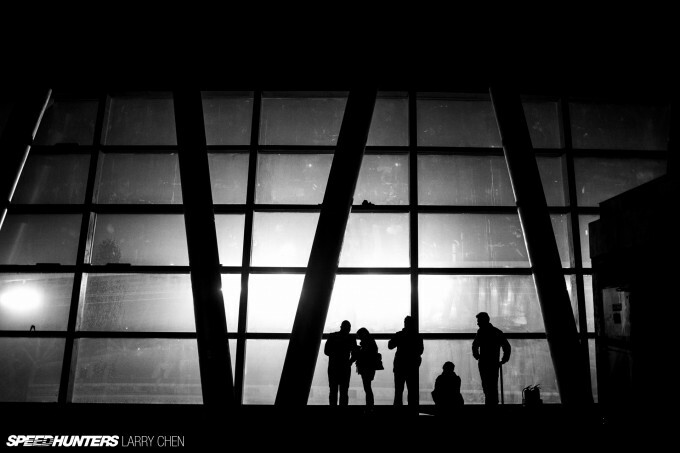 Larry Chen Haha I still revisit that video every now and then, looks like such a good time! Best article in a while. Good job Chen. 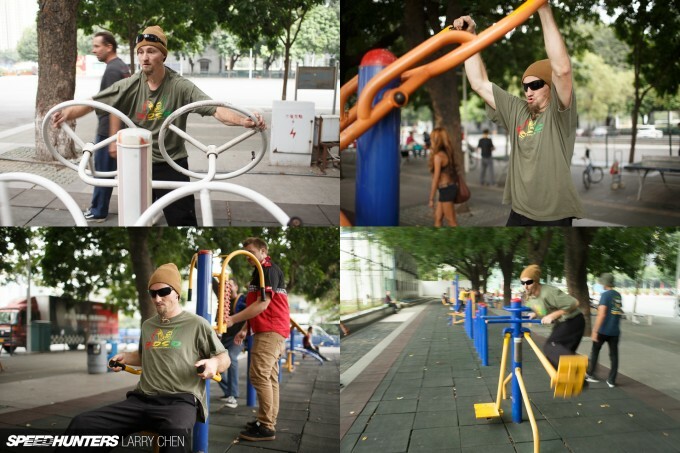 I still want to go to China with you one of these years... Looks super fun. 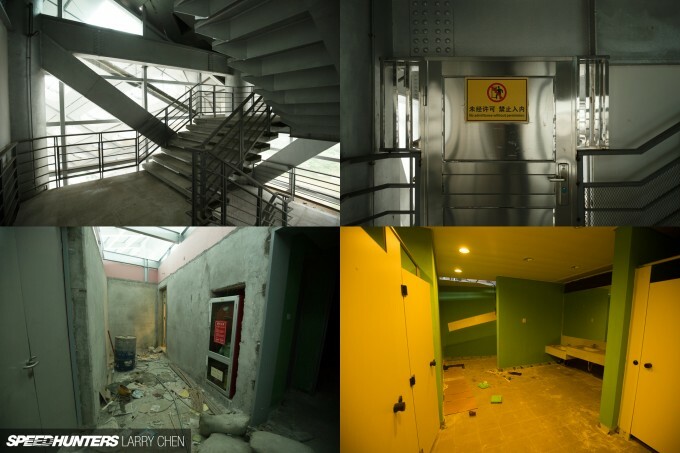 those urbex photos are pretty cool! 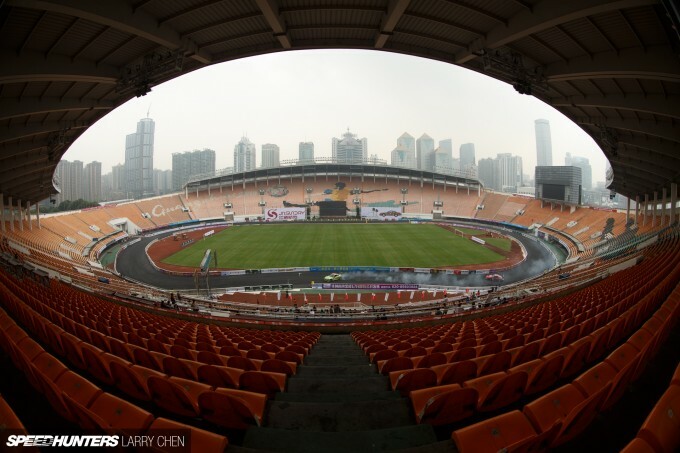 I was living near the stadium in Guangzhou, sadly I missed the event. I knew WDS China was held there, but I didn't expect the crew of Speed Hunters would come along either. Great journey, great games!